Rescuers confirmed today that they had found the remains believed to be of a missing family inside a car extracted from the rubble of the viaduct. 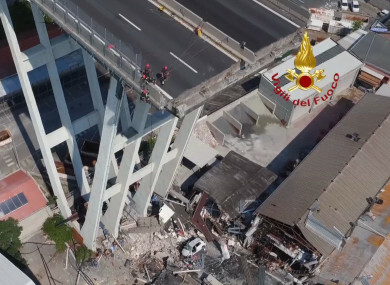 In this frame taken from a video released by the Vigili del Fuoco (Firefighters), an aerial view of the collapsed Morandi highway bridge, in Genoa. THE DEATH TOLL of Genoa’s bridge collapse rose to 43 today as rescuers confirmed they had found the remains believed to be of a missing family, a day after Italy held a funeral for the disaster victims. “The bodies of the final three missing people were found overnight,” Italy’s fire service said on Twitter today. Francesco Cozzi said the state had “abdicated” its responsibility to ensure road safety by handing motorway management to the private sector, in an interview published today. An imam led prayers for two Muslim victims – a poignant gesture in a staunchly Catholic country where the far-right is now in power and which has seen a rise in attacks on foreigners. Shortly after the official ceremony, Autostrade announced it would make €500 million available to help those affected by the tragedy and rebuild the partially collapsed bridge. The government plans to strip Autostrade of all of its lucrative contracts, which total 3,020 kilometres of Italy’s 7,000 km-long motorway network. The government announced Saturday it would provide €28.5 million for the emergency. Email “Genoa death toll hits 43 as search for answers ramps up”. Feedback on “Genoa death toll hits 43 as search for answers ramps up”.